Description: the small Spinosaurus figure stands in a walking posture, with its left leg posed forward and the left arm raised, its mouth opened as if roaring and the end of the tail bent pointing to the right. Its underside (throat, belly and inward part of the upper legs) is painted light brown, while the same colour is found on its back below the sail and the front top half of the tail, as well as above the eyes (like eye brows) and on the snout. The rest of the body is coloured regular brown, while the sail is painted dark brown. On either side of the creature, two pairs of black stripes are found, one pair on the flanks and another on the upper legs. The claws on the feet are painted black, but the claws on the hands are unpainted. The edges of the mouth are black, while the animal has white teeth and a dark pink (almost brown in fact) tongue and inside of the mouth. The figure has very small yellow eyes with black pupils, and carries a white JP logo on its right upper leg. The Velociraptor stands in a stalking pose, its right arm and leg stretched outward and its head raised upwards with its mouth open, as if it means to jump on something. The tail is raised upwards and bent at the tip. Most of the body is coloured very light green (almost beige) except for the lower legs and feet, most of the head (except for the ocular area and underside of the lower jaw) and the back, which are coloured reddish brown. On its back, this brown colouring runs over the upper arms and legs and flanks in triangular shapes. The very middle of the brown section on the back is painted yellow, which also forms similar shapes running over the brown triangular colouring. The claws on the feet are painted in the same yellow, but the claws on its hands are not painted. The figure's underside (throat and belly) is coloured in a very vague different hue of light green, and may actually be called beige when inspecting it very closely. The Raptor has yellow eyes with cat like black pupils and black eye liner, while the edges around its mouth are also black, and the creature sports white teeth and a dark pink tongue and inside of the mouth. The figure carries a black JP logo on its left upper leg. Analysis: and so the infinite repainting of smaller dinosaur figures kicks into full gear, after having been introduced moderately in JP III Camo-Xtreme. These dinosaur 2-packs offer very little besides the occasional imaginative paint jobs, except for the chance to create huge armies of identical dinosaur sculpts. Why anyone would want that is a good question. Creating armies of Imperial troops from Hasbro's Star Wars lines is not unusual, since such figures usually stand in a neutral pose and they all look alike any way. But having twenty figures of the same species in the exact same attack posture, except with totally different paint jobs, makes little sense at all. In the case of the Velociraptor/Spinosaurus 2-pack the paint jobs are at least okay. In fact, the Raptor paint job is actually quite good. The double claw like pattern on its back underscores its aggressive nature, attack posture and its own big claws. Such appeal is not to be found in the Spinosaurus, which looks a bit dull by comparison, but not a total loss either. Something more original for the sail would have been welcome. Also a real shame the claws on the hands of both creatures have been omitted, since the detailing of both figures is otherwise fairly good. The Raptor, which in normal circumstances would be more or less in scale with Hasbro's human figures (though not in the standard JP situation where Velociraptors are hugely oversized), is lucky he's almost as big as the Spinosaurus. In reality any Spinosaurus would just bite the Raptor in half. In a fight between these two dinosaurs, the Raptor with its lethal sickle shaped claws would probably win the day. Repaint: yes. Both figures are repaints of dinosaurs that originally came with human figures for the JP III line. 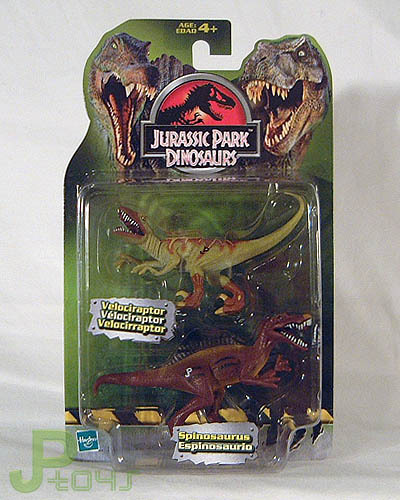 The Velociraptor was paired with Alan Grant, while the Spinosaurus belonged to Amanda Kirby. Both figures have been repainted before for JP III Camo-Xtreme, and would be repainted several times again for this line, JPD3 and JP 2009. Overall rating: 6/10. There's nothing novel to both sculpts, but these new paint jobs are adequate and certainly not as bad as some of the repaints to follow. Like most dinosaur two-packs from JPD2 and JPD3, this is one of the more common releases and it can still be found without trouble, usually for low prices because they're not in high demand (for obvious reasons).